Dark Forces was released in 1995 for the PC on MS-DOS, and I was first in line for the game at the time. I’d been playing DOOM with Dustin quite a bit around this time, and Dark Forces was the next step in the DOOM evolution for me. It’s been a while since I played this game. 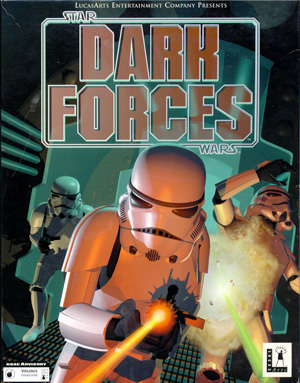 Dark Forces was a very impressive game for the Star Wars genre. And I compare that against games like Rebel Alliance (terrible) or X-Wing / Tie Fighter (good). I really played it quite a bit in 1995 when the game was released. I went from start to finished in a couple days. The game is now available on Steam as well, which was a great delight to play again! If you can image taking an already great game like DOOM and adding in a Star Wars theme to the game! If done properly, you’d have gaming GOLD. DF puts you in the middle of the gaming action with memorable Star Wars locations, weapons, characters (like Mon Mothma, Darth Vader and Boba Feth), sound effects, environments and story lines. Dark Forces wasn’t just a DOOM clone. DF pushed the gaming environment further with new features like jumping and ducking. The game includes both voice acting and cut-scenes, which help to extend the story line of the original trilogy of movies. And while you’re running through Empire bases you gets some great one-liners like “Stop, rebel scum” and “Blast him”. Those are quotes from the original Star Wars movies. The gaming environment was changed with gases, moving water and other features! The game added some new features, which at the time I remember being in the game, but these were some additional new features like jumping and ducking. The weapons had a second more powerful setting you could use to blow up more stuff! There are landmines, thermal detonators, and blasters. My favorite was almost a rail gun which could really blast bad guys quickly at a long range. Awesome! The game has a great story line, and it works really well because it fits into the Star Wars lore between the first movie and the second movie. The first Death Star has been destroyed and it was your character Kyle Katarn who supplied the information to the rebels which allowed the station to be destroyed. You’re hot on the trail of a possible new threat to the Rebels called the Dark Trooper, which is a droid-like stormtrooper, but in the end you stop them. I also really liked the fact you get to visit the planet Coruscant for one of the missions of the game. I’d previously heard of this “city planet” but it was the first time you get to interact with the place, which was a special treat. 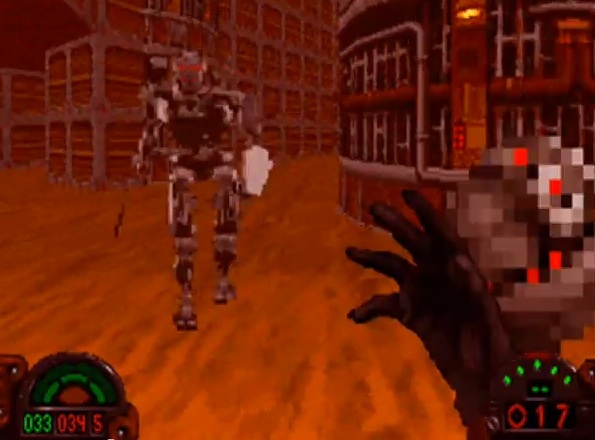 The first time you see the Dark Trooper it doesn’t have any armor on it and I remember, just like with one of the large Barons of Hell from DOOM, getting freaked out and running from the Dark Trooper all the while turning around shooting at the damn thing. After I killed it, I paused the game and took a break because it spooked me that badly.